With two months left in fiscal year 2014, state DOTs are obligating their federal funds at about the same pace as they did in 2013, according to the latest data from the Federal Highway Administration (FHWA). 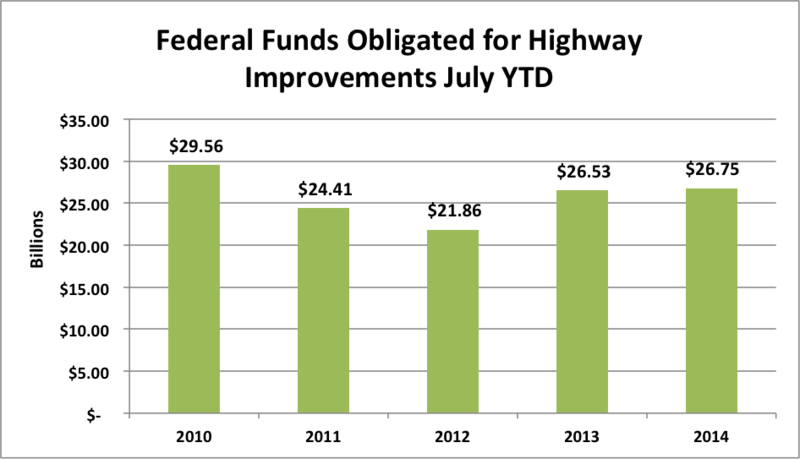 Federal highway obligations totaled $26.75 billion this fiscal year through July, a slight increase over the $26.53 billion obligated during the same period in fiscal year 2013. The obligation of federal funds is a leading indicator of future market activity. When a state or local DOT has an eligible project ready to go to construction under the federal-aid highway program, it enters into a project agreement with FHWA that obligates the federal government to pay its share of the project cost. The project can then proceed to bidding and construction. State DOTs must obligate the remaining $9.99 billion in federal aid formula funds before the end of the fiscal year, which is September 30. Comparing funds obligated by July 2013 with funds obligated by July 2014, 24 states and the District of Columbia are obligating federal funds at a faster pace than the year before. Seventeen states have obligated less money, and nine states obligated about the same amount as the year before. The pace of obligations in both fiscal years 2013 and 2014 is a substantial increase over the pace in 2011 and 2012, when funding was provided by short-term extensions under SAFETEA-LU. Detailed data by state is available as part of ARTBA’s market subscription reports. For more information, contact ARTBA’s Lital Shair.